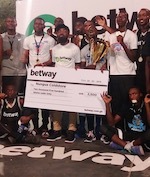 This year's GHATUSA-Ghana Technical Universities / Polytechnics Sports Association (GHATUSA) Games Basketball Finals ended earlier today at the Accra Technical University (ATU) Court in Tudu with mixed results. ATU and Takoradi Technical University (TTU) faced off in the Men's and Women's Final with either institution winning a gold medal apiece. In the Men's Division, ATU beat TTU 38-25 and in the Women's Division, TTU beat ATU 21-19. Both institutions have dominated both basketball divisions for several years and shared the spoils in this year's competition. ATU's Female team was unfortunate to force overtime or clinch the win in regulation time to lose by a two point margin. ATU's Male team raced off to a 20-8 win against Takoradi at the end of the first half but its lead was trimmed to six (26-20) heading to the fourth quarter after a strong TTU performance in the third quarter with Dennis Antwi and Benjamin Sagoe leading the charge. Sunyani Technical University (STU) and Koforidua Technical university (KTU) rounded up the podium by finishing in third place in the Men's and Women's Divisions respectively. 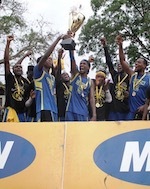 Both teams beat Kumasi Technical University (KsTU) to clinch bronze in the multisport competition.